Wardair was founded by Maxwell Ward in 1946 as Polaris Charter Co. and he started out with a DeHavilland DH.83C Fox Moth; he flew support flights for mineworkers from Yellowknife to the inhospitable far north of Canada. In 1952 Mr Ward set up the airline, using his own name, Wardair Ltd. In 1962 Wardair changed from bush flying to charter work with a Douglas DC-6 and Europe was the leading destination, though Florida was also served. Many Europeans had migrated to Canada after World War II and a market for "VHF" (visiting friends and relatives) was fast developing on both sides of the Atlantic. But Wardair remained faithful to Yellowknife, operating Bristol 170s, 3 DHC-3 Otters and DHC-2 Beavers. In 1966 a Boeing 727 was introduced to the fleet, the first jet. It operated across the Atlantic. It was followed by 2 Boeing 707s two years later. Wardair was popular among the public, setting standards for holiday travel. In May 1973 the giant Boeing 747 was introduced , while competition was often still operating propellor-driven equipment. Later McDonnell-Douglas DC-10s were also added (1978). Wardair operated its charters from Vancouver, Calgary, Edmonton, Winnipeg, Montreal, Ottawa, Saskatoon and Toronto. Destinations were found in Europe, the Caribbean, Mexico and the southern USA. By 1976 Wardair had grown in Wardair International, a holding company including Wardair Canada (the airline), but also interests in hotels and tour operators. 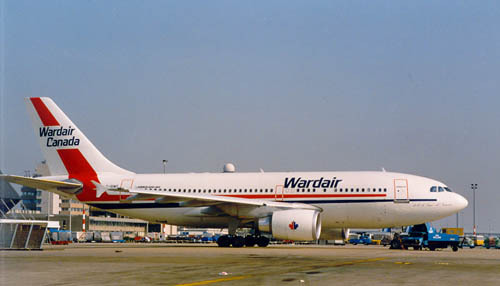 During the 1980s Wardair ran into problems; a reorganisation was needed and it was decided that the Airbus A310-300 would become the standard aircraft of the fleet (1987). By end-1980s Wardair had become the third airline of Canada and MD-80s were ordered for use on domestic routes. However, these were not delivered, as quite surprisingly the company was bought by Canadian Airlines in 1989. From 15Jan90 the companies merged and Wardair vanished from the North American and European Skies.